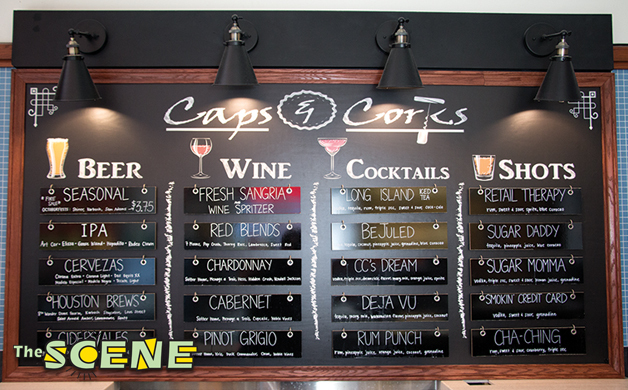 Caps & Corks, a cocktail bar located in the food court area of Baybrook Mall, offers shoppers the opportunity to “Sip and Shop” every day of the week. Yes, really! Customers can take their drinks with them as they stroll from store to store inside the mall; or sit down at the bar, take a break from shopping and relax with a glass of wine, a cold beer or a frozen margarita. With three large HDTVs, Caps & Corks is like a sports bar oasis for those who reluctantly came to the mall because they didn't want to miss the game. The bartenders joke that it's a “husband daycare” for wives who would like to keep their significant other content while they shop. “Our customers have been predominately male in the past, but lately we’ve been getting a lot of groups of ladies who prefer to have ‘sip and shop’ days over ‘girls night out’ with their group of friends,” said owner Stephanie Warren. election of craft beers including 8th Wonder’s Dome Fauxm, Rocket Fuel, Love Street, and a selection of IPAs, hard ciders and seasonals. The large menu board lists the current specialty drinks and shots (made from premium wine-based liquors) with clever names like, Buyer’s Remorse, Retail Therapy, Cha Ching and Smokin’ Credit Card. “We definitely sell a lot of craft beers, but customers really love the “Shopaholic,” our fancy version of a Long Island Tea, and many have told us our Long Island is the best they’ve ever had,” said Warren. Happy Hours are Monday through Thursday from 11a.m. to 4p.m. and include $2.50 Mimosas, $3.50 House Wine, $4.50 Frozen Ritas and $6 Long Island Teas/Shopaholics. Open year-round, Caps & Corks has been easing buyer’s remorse and lifting shopper's spirits for more than four years now, and they are looking forward to another bustling holiday shopping season. So if holiday shopping isn’t typically your “cup of tea,” stop by Caps & Corks this year, and order your favorite drink to help make your season a little merrier. Be sure to tell them the SCENE sent you.